Replay are once again be teaming up with Marine Studios, organisers of the fantastic GEEK festival in Margate. Later this week GEEK hits Birmingham for a fantastic weekend of gaming and play at the famous Custard Factory! Playstation, Xbox, Nintendo, Game Cube, Sega, Atari, Commodore, Spectrum, PC or LAN where will you choose to face your nemesis? See props and costumes from major movies including Bumblebee and Barricade cars from the Transformers movie! Plus tournaments, Cosplay, workshops and more. GEEK Birmingham runs on the weekend of 20-21 September at the Custard Factory in Birmingham, with a special launch party on the Friday evening. 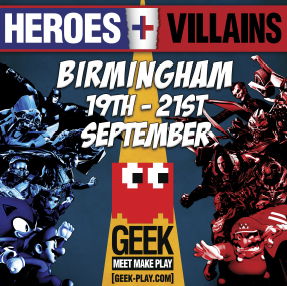 Visit the GEEK Birmingham website for more info.